Perhaps some history on Port of Bellingham Commissioner (District 2) candidate Ken Bell’s actions as an elected official in 2015, will remind voters why they need to vote FOR Barry Wenger for Bellingham Port Commissioner, District 2. Ken Bell tries to sell himself as though he is a moderate, politically, but, he’s not. It’s important for this November election, that voters remember, or are aware of, some of Ken Bell’s actions in 2015, when he was a Whatcom County Charter Review Commissioner. Bell was one of the nine elected conservative Charter Review commissioners who voted to approve the district-only voting Charter Amendment that was then placed as a proposition on the 2015 November general election ballot, and was subsequently approved by County voters that year, such that voters now have to elect their County Council members by district-only, and no longer vote by countywide election (there are two At-Large Council positions). During the 2014 Whatcom County elections, Ken Bell (and seven other conservative Charter Commission candidates) received the benefit of Independent Expenditure advertising toward their 2014 Charter Review Commission campaigns from the coal terminal interest-funded SAVEWhatcom/Whatcom First PACs, after those PACs had received $10,000 from coal terminal applicant SSA Marine/Pacific International Terminals (PIT). In local Republicans’ and Tea Party members,’ and coal terminal applicant Pacific International Terminals’ endeavors to foist the district-only voting scheme on Whatcom County voters in 2015, Ken Bell was one of the Charter Review Commissioners who was included in email communications with local Republican and Tea Party members, Republican political operatives, and a paid consultant on the Gateway Pacific Terminal (GPT) project for PIT. Not all of the conservative/Republican Charter Commissioners were included in those strategic communications with GPT consultant Dave Brumbaugh, but Ken Bell was one of the select commissioners who was included. I know that from having read through hundreds of email records provided by Whatcom County in response to my public records request in 2015, for Charter Review commissioners’ email communications. 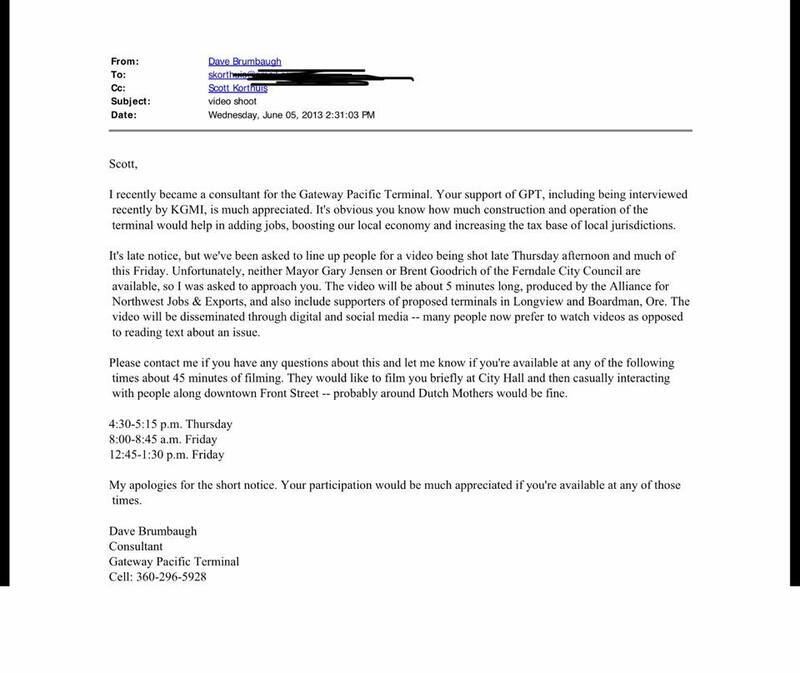 I have attached screenshots of some of those 2015 Charter Review email records, as well as a 2013 email from Dave Brumbaugh, in which he stated he was working as a consultant for GPT. The 2015 Charter Review Commission was used as a vehicle for coal terminal interests to facilitate their goal of placing the “right” individuals onto the County Council who would then be most likely to render the favorable land use decisions which a number of groups desired for various reasons. One of those land use decisions the County Council would make is on the permit needed for the GPT project, and, that is how a typically obscure Charter Review Commission election and process ended up gaining the spotlight, and turned into a critical battleground for, and against, fossil fuel interests setting their sights on Cherry Point. Then-consultant for GPT, Dave Brumbaugh, sent a May 13, 2015, email to Whatcom Tea Party board member Kris Halterman, and Ccd twenty-two other active local Republicans/conservatives including board members and leaders from the Whatcom Republicans and Whatcom Tea Party, Whatcom Business Alliance President Tony Larson, State Rep. LuAnne Van Werven, and others. Three of those twenty-two recipients, were Charter Review Commissioners, one of whom was Ken Bell. 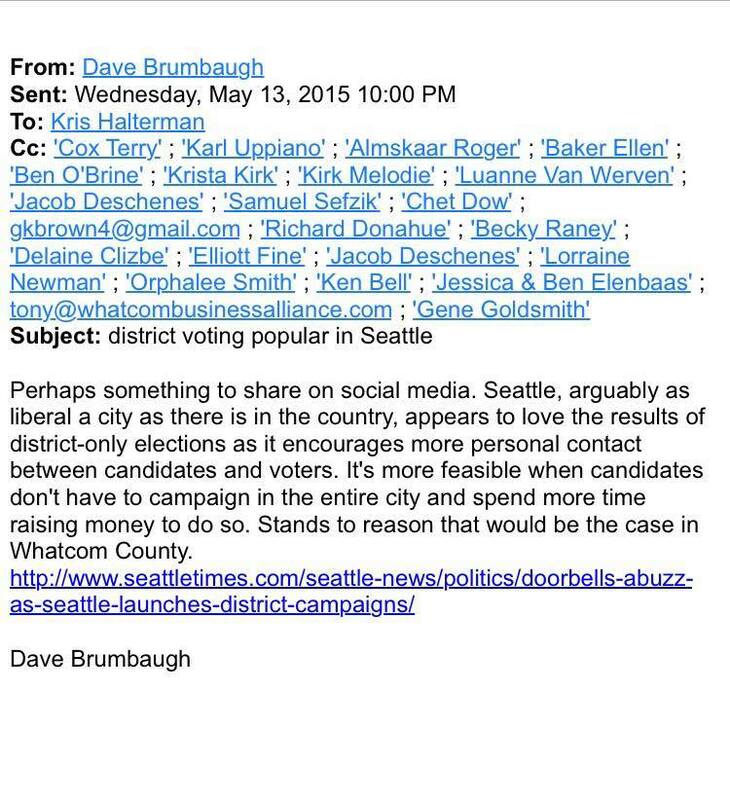 In his email, Brumbaugh provided some reasoning why district-only voting could be good for Whatcom County, included a link to a July 2015 Seattle Times article on district-only voting, and he suggested the recipients might want to share the article on social media. Of the three conservative Charter Review Commissioners who received a copy of that May 13, 2015, email, only Chet Dow, also a Republican executive board member, disclosed that email to the County by providing it in response to my public records request. Ken Bell never provided that email to the County Public Records Officer. Brumbaugh also sent a May 15, 2015, email to then-Charter Review Commissioner Chet Dow, advising him on how to handle the opposition to the district-only voting charter amendment that had already been passed at the February 23, 2015, Commission meeting by the conservative majority of the Charter Review Commissioners after only approximately 15 minutes of debate. 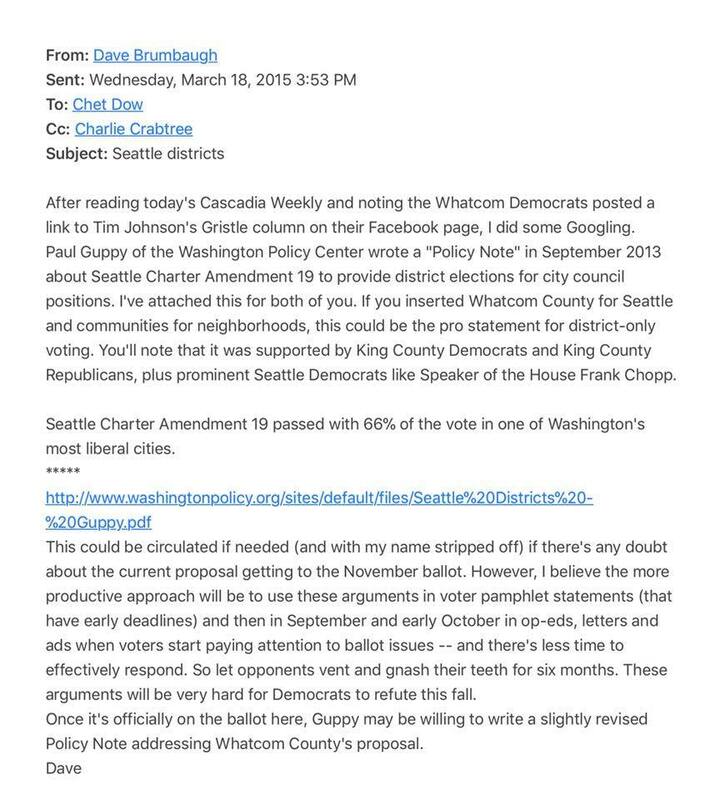 On March 18, 2015, Brumbaugh sent an email to then-Chair of the Whatcom Republicans Charlie Crabtree, laying out his (his client, PIT’s) strategy path toward getting the district-only voting scheme approved by voters that fall. Brumbaugh went on to say that he thought the more productive approach would be to use those arguments in the Voters’ Pamphlet statements where there are early deadlines, then follow with op-ed pieces, letters to the editor, and ads in September and October as he said voters start paying more attention to ballot issues — giving the opposition less time to effectively respond. Bell even went so far as to be featured in two campaign videos used in the 2015 general election; one video in support of the district-only voting proposition 1, and propositions 2 and 3 (which set a very high bar in order to unlock Prop. 1), and one video against propositions 9 (“Five Fair and Equal Districts”) and 10. No other conservative Charter Review Commissioner appeared in those — just Ken Bell. I have included links to those videos below. The videos were paid for by the DOVE Whatcom PAC which was headed up by then-leader of the Whatcom Tea Party, Karl Uppiano. The top donors to DOVE Whatcom PAC were the Whatcom County Republican Party and Common Threads Northwest, the entity that had filed a lawsuit in August 2015, against Whatcom County, in an effort to try to keep Prop 9 “Five Fair and Equal Districts” off the November 2015 ballot. Then-Charter Commissioner Chet Dow is listed as one of the governing officers for Common Threads Northwest. During the 2015 Whatcom County election season, GPT applicant PIT dumped over $42,000 into the Whatcom County Republican Party PAC which funneled funds into the two conservative candidates’ campaigns for County Council; to a candidate (Gary Jensen) running for Port of Bellingham Commission at that time; and to the DOVE Whatcom PAC supporting propositions 1, 2, and 3, and opposing propositions 9 and 10. So, to review, then-Charter Review Commissioner Ken Bell, was included in some of the email communications with local Whatcom Republican operatives, Whatcom Tea Party leadership, and Dave Brumbaugh, a paid consultant for the then-coal terminal applicant, PIT. For Bell to now, two years later, try to distance himself from the local Republican Party is disingenuous, at best. Ken Bell was involved with local Republican operatives, Tea Party leadership, and a coal terminal consultant in foisting district-only voting on our County in 2015, which we are now having to endure. Vote FOR Barry Wenger for Port of Bellingham Commissioner, District 2! This entry was posted in Commentary, Facebook Post, Information and tagged Barry Wenger, Chet Dow, Dave Brumbaugh, District Only Voting, Five Fair and Equal Districts, Gateway Pacific Terminal, GPT, Ken Bell, Kris Halterman, November 2015 Election, November 2017 Election, Pacific International Terminals, PIT, Port of Bellingham, Proposition 1, Proposition 2, Proposition 9, Public Records Request, SAVEWhatcom PAC, SSA Marine, Tony Larson, Whatcom County, Whatcom County Charter, Whatcom County Charter Review Commission, Whatcom Republicans, Whatcom Tea Party. Bookmark the permalink. Flunk 8th Grade, run a Jim Crow voting standard! A requirement shown best in McCleary v. State of 8th grade dropouts!